Agricultural intensification is a leading cause of landscape homogenization, with negative consequences for biodiversity and ecosystem services. Conserving or promoting heterogeneity requires a detailed understanding of how farm management affects, and is affected by, landscape characteristics. 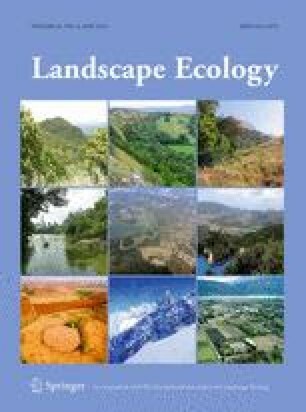 We assessed relationships between farming systems and landscape characteristics, hypothesising that less-intensive systems act as landscape takers, by adapting management to landscape constraints, whereas more intensive systems act as landscape makers, by changing the landscape to suit farming needs. We mapped dominant farming systems in a region of southern Portugal: traditional cereal-grazed fallow rotations; specialization on annual crops; and specialization on either cattle or sheep. We estimated landscape metrics in 241 1-km2 buffers representing the farming systems, and analysed variation among and within systems using multivariate statistics and beta diversity metrics. Landscape composition varied among systems, with dominance by either annual crops (Crop system) or pastures (Sheep), or a mixture between the two (Traditional and Cattle). There was a marked regional gradient of local landscape heterogeneity, but this contributed little to variation among systems. Landscape beta diversity declined from the Sheep to the Crop system, and it was inversely related to agriculture intensity. Less intensive farming systems appeared compatible with a range of landscape characteristics (landscape takers), and may thus be particularly suited to agri-environmental management. More intensive systems appeared less flexible in terms of landscape characteristics (landscape makers), likely promoting regional homogenization. Farming systems may provide a useful standpoint to address the design of agri-environment schemes. The online version of this article (doi: 10.1007/s10980-015-0287-0) contains supplementary material, which is available to authorized users. This study was supported by the Portuguese Foundation for Science and Technology (FCT) through projects PTDC/AGR-AAM/102300/2008 (FCOMP-01-0124-FEDER-008701) and PTDC/BIA-BIC/2203/2012 (FCOMP-01-0124-FEDER-028289) under FEDER funds through the Operational Programme for Competitiveness Factors—COMPETE and by National Funds through FCT—Foundation for Science and Technology, and grants to PFR (SFRH/BD/87530/2012), JS (SFRH/BD/63566/2009) and LR (SFRH/BPD/93079/2013). Program CIÊNCIA 2007 provided support to PB and FM. Agricultural statistics were provided by the Instituto de Financiamento da Agricultura e Pescas—IFAP I.P., Portuguese Ministry of Agriculture. We thank the Editor and three anonymous reviewers for their valuable comments and suggestions that helped improve the manuscript.